After visiting two cities in a country notoriously known for gang violence, drug cartels and murders, I fully understand why people who have never visited would feel the need to caution others not to go. Take it from me though, I experienced the danger first-hand. 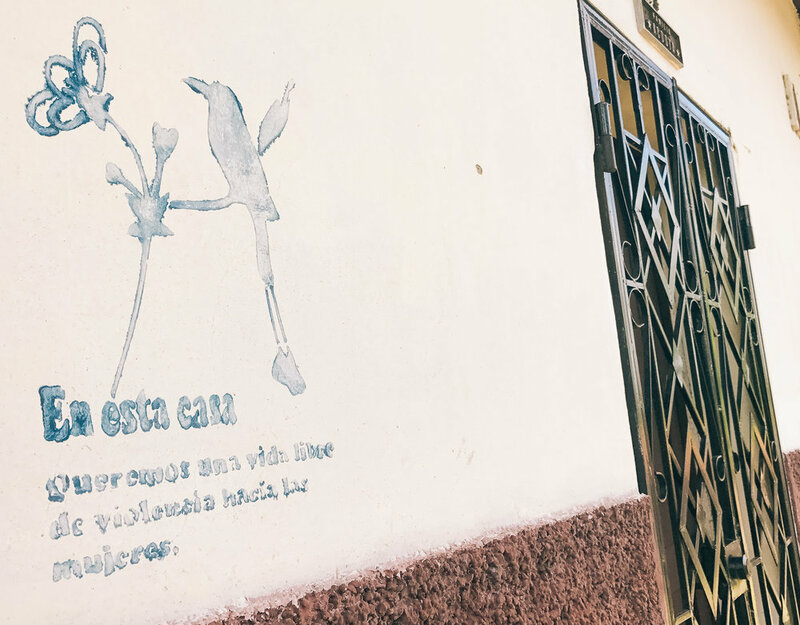 "In this house we want a life free from violence towards women"
We arrived in Suchitoto in the evening and after a brief introduction from the Intrepid Tour manager, we walked three minutes to the nearest pupuseria. For those that have been deprived of a pupusa, it’s a typical dish of El Salvador. It's a thick tortilla filled with cheese, topped with cabbage and a red salsa. Don't be fooled by its ridiculously basic description, I assure you is so tasty it’s hard to stop at only one. We sat on the small terrace in front of the restaurant where locals and tourists sat on white plastic chairs, enjoying their $1 pupusas. The only danger I encountered was the spice of the salsa making my lips feel slightly on fire. Fuego! The following day Gary and I went on a guided tour of the small town that is Suchitoto, known for its colonial buildings and cobblestone streets. 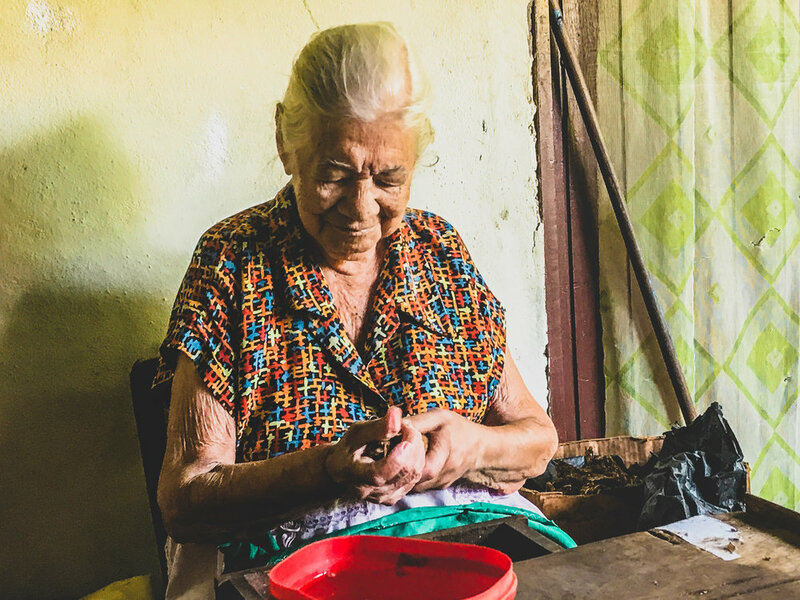 It’s also the home of a 97-year-old lady who has been hand rolling cigars since she was 6 months old (according to her) and still hand rolls and sells them out of her house. We also went on a walk to a waterfall and viewpoint and learned about Indigo, a native plant used to deposit a blue dye on textiles. The most dangerous part of our day; traveling like the locals do as we stood in the bed of a pick-up truck while our guide drove to each location. Our next and final destination in El Salvador was El Cuco. After spending almost a full week exploring cities, we were ready for a couple days of fresh coconuts and sand between our toes. Our beach side accommodation at La Tortuga Verde was humble but satisfied our basic needs and I mean, when there’s air conditioning in the room how can you complain? I know, first world problems. We spent our two days in El Cuco, eating, drinking coffee, filming and photograpghing and of course exploring the endless stretch of beach. It was a really dangerous two days we experienced here, the local gang in El Cuco are the mosquitos, they assaulted us a few times. El Salvador really surprised me; it wasn’t anything like what people described. I got to experience all the “dangers” myself and surprisingly I lived through it, so now I get to stand on my soap box and say; maybe we shouldn't take what we hear about a country, city or even person for that matter, so seriously. Let’s keep our minds open to experiencing things for ourselves and allowing our own personal opinions to be formed without being jaded by someone else’s. 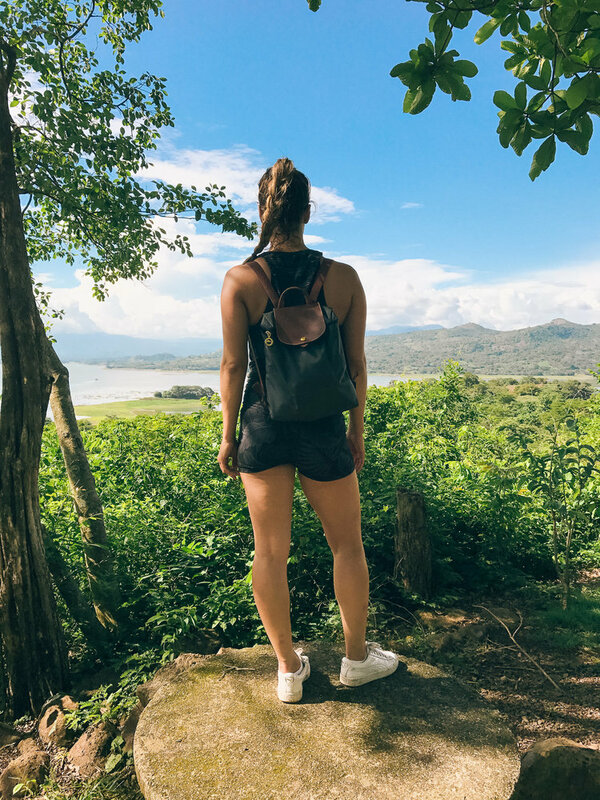 My take on El Salvador is a very positive one; I overdosed on pupusas, enjoyed getting a glimpse of local life, and the people were friendly. But don’t take my word for it, after all there’s nothing truer than your own experience.